‘Tis the season for selecting the perfect gifts for all the ‘nice’ little boys and girls on your list. We make it effortless for you to find wow-worthy presents, priced for varying budgets, to suit a wide-range of interests and affinities. There’s no need to fight crowds at a packed shopping mall when you can peruse our guides: eco holiday gifts for boys, off the beaten path holiday gifts for girls, awesome sustainably designed holiday gifts for tots, 6 fresh, fascinating gifts for girls and boys, 5 eco-friendly gifts for little foodies, 6 simple, DIY gifts for siblings, 6 non-materialistic, experiential presents and more gloriously original gift selections for gals. When you shop our guides, you can rest assured that every gift suggestion is safe and non-toxic for your kiddos. If you venture out on your own, be sure to review our 7 green and safe toy rules you should follow during the holidays and beyond. When it comes to wrapping the presents, go the green DIY route and fashion this festive gift wrap out of brown paper grocery bags. Happy Holidays! 'Tis the season for selecting the perfect gifts for all the 'nice' little boys and girls on your list. We make it effortless for you to find wow-worthy presents, priced for varying budgets, to suit a wide-range of interests and affinities. There's no need to fight crowds at a packed shopping mall when you can peruse our guides: eco holiday gifts for boys, off the beaten path holiday gifts for girls, awesome sustainably designed holiday gifts for tots, 6 fresh, fascinating gifts for girls and boys, 5 eco-friendly gifts for little foodies, 6 simple, DIY gifts for siblings, 6 non-materialistic, experiential presents and more gloriously original gift selections for gals. 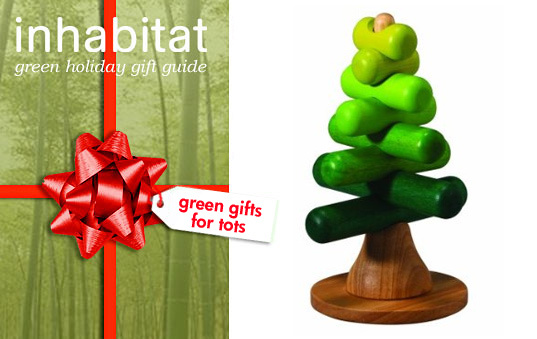 When you shop our guides, you can rest assured that every gift suggestion is safe and non-toxic for your kiddos. If you venture out on your own, be sure to review our 7 green and safe toy rules you should follow during the holidays and beyond. When it comes to wrapping the presents, go the green DIY route and fashion this festive gift wrap out of brown paper grocery bags. Happy Holidays!